If a thousand men were not to pay their tax bills this year, that would not be a violent and bloody measure, as it would be to pay them, and enable the State to commit violence and shed innocent blood. This is, in fact, the definition of a peaceable revolution, if any such is possible. This will be the first year I willfully and intentionally do not pay my full share of income tax. I certainly have no illusions that I am Henry David Thoreau -- frequent readers of mine will attest to that -- nor do I believe that withholding a portion of my federal income taxes will cause the American war machine to grind to a halt, or that the sufferings of millions in wars around the world, wars supported, directly and indirectly, by the U.S. government and U.S. industry, will be ended. However, no longer can I look past the reality that my annual voluntary forfeiture of money to my government pays for violence around the globe, at astounding levels, and I am not able to provide any more excuses or rationalizations that paying without protest, that being complicit in funding war without resistance, is not contradictory to my faith and to my conscience. Quite simply put, I can no longer ignore the basic, yet just, wisdom and truth found in the war tax resisters' dictum: "If you work for peace, stop paying for war." I fought in our Global War on Terror with the marines, and I even worked as a modern day colonial administrator, at one time having $26 million in cash in two safes in my bedroom in Tikrit, Iraq. My participation in these wars has left me with moral injury, a condition that is, thankfully, becoming better understood in the veterans and medical communities. In 2009, while serving with the State Department in Afghanistan, I could no longer go along with the war, let alone its escalation, and I resigned in protest. For the last five and one half years I have worked as a peace advocate in various degrees and capacities. As I have progressed in my healing from the psychiatric wounds of war, I have continued on my own path of advocacy for peace. I relate this personal information to you, not to proselytize myself, but, rather, to illustrate that the decision to willfully resist taxes to oppose war is not one I have entered into lightly or one that comes as a singular event in my life, but one that is a culmination of my life's experiences. As I have come to accept that I can no longer justify providing money to my government to pay for the bombs and bullets our forces use to kill millions abroad, or contribute to the funds that supply and resupply the arsenals of our allies, such as Egypt, Israel and Saudi Arabia, as they kill others and repress their own people, my choice to willfully not pay taxes has crystallized. It has been aided, in great part, by the testimonies of those who have practiced war tax resistance, in some cases, for several decades, and who by their courage and dedication to laws of love and peace have risked the authority of the federal government to follow what is right. I am also indebted to peers like Rory Fanning and Logan Mehl-Laturi and old friends, like Count Leo Tolstoy, who, by articulating their convictions, have helped not just to educate me, but to embolden me. I do not have a legal issue with taxation, and I have no interest in self-enrichment. I want to pay my fair share for the services our government provides, so utilizing the information provided by the War Resisters League, I will calculate the income tax I owe, as I have done in any previous year, and pay only the portions our federal government utilizes for services other than war. I will file my taxes and include a letter to the IRS explaining why I am not paying in full and why I will not pay in full. If they want the money for killing, then they will have to take that share. As a recipient of Veterans Administration assistance, and as someone who thoroughly understands the need to heal the wounds of war, my contribution will include payment for veterans services. 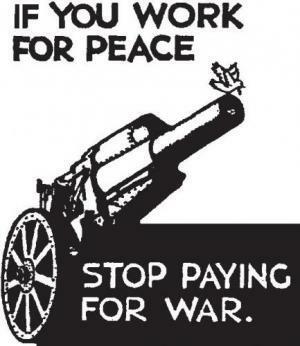 I will also pay for the debt owed to past wars, as that is something that cannot be undone. What I do not pay to the government for the functions of war I will redirect and donate to a five star-rated veterans charity. I do all this with the complete understanding that our government will just allocate the amount I pay to war functions anyway, and that the small amount I am withholding will not cause Secretary of Defense Ashton Carter to lay awake at night. However, it is an act I take pride in, as I can now rest my conscience knowing that I am no longer fully and voluntarily participating in wars that are not just immoral, but counter-productive. For how many more millions will we kill just to keep seeing terrorist groups metastasize and ensure kleptocracies remain in power? There is also some edification in putting some element of myself and my life, however small this really is, in the path of militarism and its counterparts: death, suffering and waste. It is not very common for war tax resisters to have property seized by the IRS, and even more rare for someone to face jail time. The most common consequences that thousands of war tax resistors face each year are accrued penalties and interest, wage garnishment and property liens, plus lots of unfriendly letters. Everyone's case is different and, so, I wonder whether my VA disability pay will be docked or my utility of the GI Bill to pay for attendance at seminary or graduate school thwarted. If so, so be it, I'm done with taking part in war. I urge you to follow your conscience, listen to your heart, find strength in your faith and in humanity, as well as in the brave individuals who have journeyed before us, and join me in a peaceful revolution of conscience. War Tax Resistance predates Christianity and has, within our own American history, many chapters. I hope this essay makes a difference for someone in their own personal journey of peace advocacy, just as others who have made known their resistance have positively influenced me. The National War Tax Resistance Coordinating Committee is a great place for individuals who are struggling with issues of war, faith and conscience to turn to, as it has been a great source of support for me, both educationally and inspirationally. Additionally, you can add your voice of support for those who find their conscience violated by paying for war by supporting Representative John Lewis and asking him to re-introduce his Religious Freedom Peace Tax Fund Act and by supporting the National Campaign for a Peace Tax Fund.